Grow Op is more than a garden show - it's essentially a plant-themed festival taking over the Gladstone Hotel for four days starting today (April 21 - 24). This year's exhibit, titled Cultivating Curiosity encompasses special evening events, workshops, and over 30 installations. 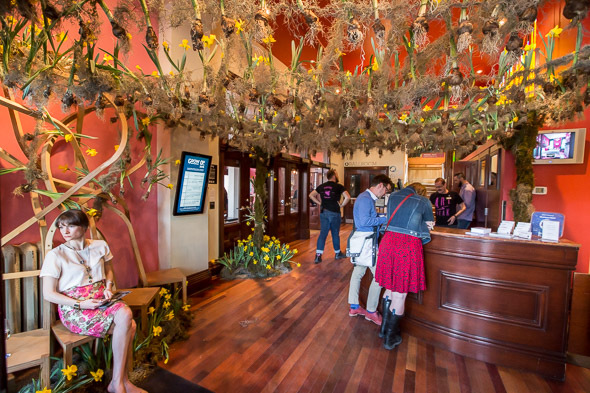 Through these immersive experiences, Grow Op touches on urbanism, environmental sustainability, landscape design, and contemporary art - with hopes of reframing our understanding of our place in nature. Tickets to the exhibit are $11, although certain events are free to attend. Here are 5 things to do at Grow Op 2016. Grow Op features work from over 30 artists ranging anywhere from reworked furniture to large-scale, interactive pieces. David Perret created sculptures out of weighted tree trunks that viewers can interact with like an inflatable punch bag. Design Build Grow Studio created a hydroponic garden out of everyday materials to inspire people to produce what they normally would just consume. From 6 - 10 pm tonight (April 21), the Ballroom at the Gladstone Hotel will be home to Grow Op's Alternative Food + Drink Show, highlighting a slew of vendors aiming to make the future of food sustainable, ethical, and organic. RISE Kombucha, KW Craft Cider and C-fu Foods are some of the event's most explorative foodies and chefs. Tickets are $11 for food only; $16 for food and drink. This Sunday (April 24) from 10 am - 4 pm, peruse goods from local, ethical, and environmentally sustainable makers at the Grow Op edition of the Gladstone Flea. Free to attend, the market will offer guilt-free fashion finds, vintage scores, and other gems from over a dozen labels. Grow Op will host both on and off-site workshops throughout the weekend to help you become one with nature again. Stay inside the Gladstone Hotel and make seed paper with Christina Bowen tomorrow (April 22) from 1 - 3 pm or take a walk with Bird Studies Canada on Sunday (April 24) from 1 - 3 pm! Celebrate Earth Day with likeminded individuals tomorrow (April 22) at Grow Op's opening reception from 7 - 10 pm; absorb the exhibit as well as the booze! Then, head to the after party in the Melody Bar. Installations pictured in order: The floating grass landscapes, Terrena, designed and built by Ryerson's [R]ed[U]x Lab collective (Cathy Truong, Matthew Brenton-Honeyman, Erik Aquino + Abhishek Wagle). 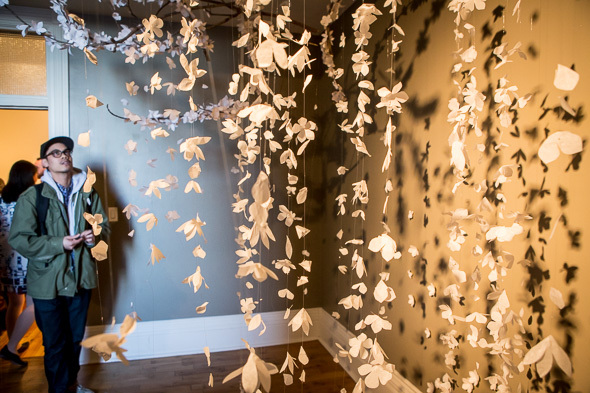 Paper leaves, All Night Blossoms Fell, designed and built by Wabi-Sabi collective (Vivian Wong, Sann Sann Lam, Marshall Hryciuk, Karen Sohne + Lisa Keophila). Fower bulbs at the Gladstone Hotel entrance,Persephone, designed and built by Toronto Flower Market Local Growers and Flower Designers.